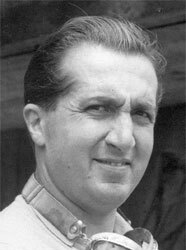 Enzo Ferrari described Alberto Ascari as being 'virtually impossible to overtake' when leading. It is a notion to which the 1952 season attests, since Ascari was victorious in six of the year's eight races, before going on to win the first three grands prix of 1953 (not counting the Indianapolis 500). With these feats Ascari established records for the highest percentage of wins in a season and for the most consecutive wins from races started, both of which remain unbroken almost six decades later. Ascari lost his life while testing a Ferrari sportscar at Monza in May 1955. His death held eerie similarities to that of his father, Antonio, himself a grand prix driver; each met his end on the 26th day of the month, seven weeks shy of his 37th birthday and with 13 grand prix triumphs to his name. Should Alberto Ascari be higher or lower in F1's greatest drivers?